I attended the 5th International Conference on Nutrition and Nurture in Infancy and Childhood: Relational, Bio-cultural and Spatial Perspectives from Wednesday, 5 November 2014 – Friday, 7 November 2014. Those who know me or follow my work will know that I am deeply interested in eating and thinking about food. I’m interested in how food structures our days and our lives,it nourishes and sustains us, reminds us of people, events, history, all in a mouthful. 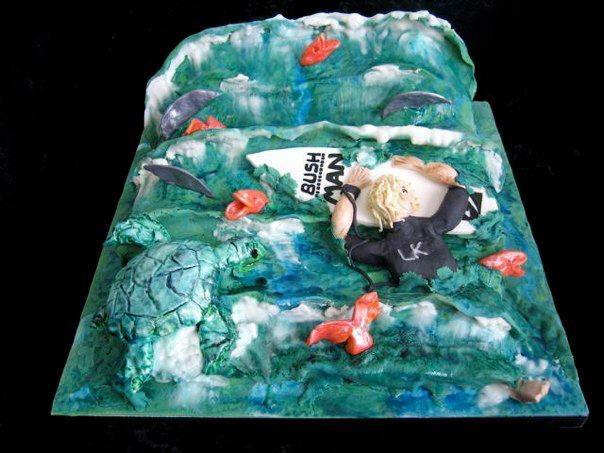 A special birthday cake, made for a surfer on his special birthday. I’ve written elsewhere about how migrants perform identity through food preparation and consumption. I’ve also written about consumptive multiculturalism. I’m also interested in the provision of food in (monocultural) institutional contexts such as health where people are racialised by the foods that they eat and how the processes of hospitalisation strip people of their cultural and social identities and often lead people into being unable to access culturally appropriate food. This presentation brings those ideas together. Food, its preparation and ingestion, constitutes a source of physical, emotional, spiritual and cultural nourishment. Food structures both daily life and major life transitions, including the transition to parenthood, where food is prepared and consumed that recognises the unique status of the mother. However, the reductive focus of hospitals where efficiency, economy and a focus on nutrients dominate and where birth is viewed as a normal event can mean that there is a mismatch between the cultural and religious dietary needs of migrant mothers with the food that is available from Western instititutional environments. In this paper I outline a research study, which examined the transition to parenthood among new migrant groups in New Zealand. Based on a number of focus groups with mothers and fathers, the data were analysed using a postcolonial feminist lens and drew upon Foucauldian concepts to examine the transition to parenthood. The findings show that Asian new migrant parents construct the postnatal body as vulnerable, requiring specific kinds of foods to facilitate recovery from the trials of pregnancy and delivery and optimize long term recovery from pregnancy. This discourse of risk contrasts with the dominant discourse of birth as normal, and signals the limitations of a universal diet for all postnatal mothers, where consuming the wrong food can pose a threat to good maternal health. Paying attention to what nutrition and nurturing might mean for different cultural groups during the perinatal period can contribute to long term maternal well-being and cultural safety. Health practitioners need to understand the meanings and significance attached to specific foods and eating practices in the perinatal period. I propose that institutional arrangements become responsive to dietary needs and practices by providing facilities and resources to facilitate food preparation. I’m hoping that the written form of the paper becomes part of an edited book about mothers and food. Fingers crossed, it’s under review at the moment.